This kit includes sterile bandage materials, wound care, blister/burn care, CPR face shield, fracture/sprain care, common medications, and essential tools, all contained in a high-visibility kit. Designed for adventurous hunters and fishermen, the Whitetail contains supplies to treat the most common injuries in the field. 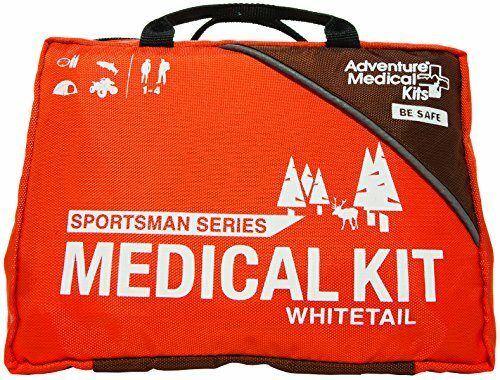 Provide hospital-quality care for groups of up to four people on trips of up to four days with this portable, rugged kit suited for boat, basecamp, or backpack duty. Weighing in at just under a pound and compact enough to fit in any pack, treat penetration wounds from bullets or arrows, remove fish hooks, splint fractures, and stop severe bleeding, all from secure see-through compartments to quickly gather the supplies you need. Included $16 field manual: "Comprehensive Guide to Wilderness & Travel Medicine", with 43 first aid categories and 160 subcategories including "Weiss Advice" improvised techniques, "When to Worry" tips on recognizing life-threatening conditions, 97 illustrations and information on how to use your Adventure Medical Kit.